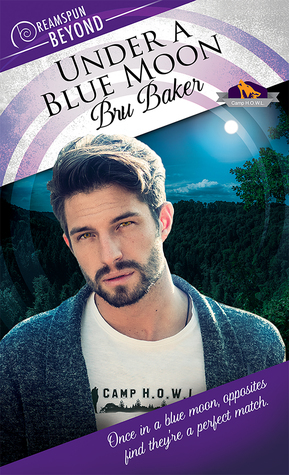 I really liked Under a Blue Moon by Bru Baker. It’s the second book in the Camp H.O.W.L. series and the twenty-second book in the Dreamspun Beyond series. This book is well written and nicely edited. The characters were developed, and I loved the Catch Me If You Can part of the book. That part and the part where Nick and Drew have to take the classes that the camp offers and they turn it into a competition of who can do it better, the human raised by werewolves or the werewolf. I loved how it helped show Nick that just because Drew is human that having been raised by werewolves and having werewolf stepbrothers has taught him how to use what he’s got to survive and thrive around werewolves and that he would be worthy of being in a relationship. I did like the little detail about them having their one-night stand while under a blue moon and that Drew’s mom and stepdad met and fell in love under a blue moon also and that they were proof that a human/werewolf relationship could last and flourish. Poor Nick Perry is a psychologist and is tired of helping people with their marriages. So when a spot opens up to work with teens at Camp H.O.W.L., he jumps at it. Nick has seen too many relationships ruined by secrets, and this is just between people of the same species since he primarily sees humans. So he’s a big believer that an interspecies relationship doesn’t stand a chance of working and has a firm no dating humans rule. They are perfectly fine for one-night stands but absolutely not for dating. I can understand where he is coming from with that rule since they aren’t supposed to be telling humans what they are to protect the community, so yes dating a human that doesn’t know that you’re a werewolf would be hard on the relationship especially with how they wolf out on the full moon. But he is so stubborn about his attraction to the new camp doctor who, although human, was raised with werewolves so not quite the same scenario as dating a human that doesn’t know about the paranormal community. I admit to wanting to hit Nick upside the head on more than one occasion for being so stubborn and forcing Drew to constantly prove that he’s just as good as a werewolf and more than a match for Nick. But he was still a loveable character, and the chemistry between him and Drew is hot. Drew is a human and a doctor, but he’s been part of the Were community all of his life. He has no trouble fitting in at the camp as their new doctor. Except for Nick’s stubborn refusal to acknowledge the growing attraction between them and his ridiculous stance on dating humans and forcing him to constantly prove that he’s just as good as a Were. And he’s just as good because his stepbrothers have seen to that. I really liked how happy-go-lucky Drew is and how he wants to help the patients that he sees in his little private practice in town. It doesn’t matter to him whether they are human or paranormal. When he gets a case that he’s sure is an ongoing domestic abuse case, he asks Nick for his advice and to see if the woman will talk to him and try to get her some help. When the boyfriend shows up, it all goes to hell. But will the close call be enough to help Nick see that a connection like theirs isn’t something to let go of? You’re just going to have to read the book to find out. I’m not going to tell you. But it was definitely worth reading. And I can’t wait until the next book in the series.